Any web designer will tell you that rule number one in planning and executing a successful website is the anticipation of the customer’s needs. This seems like a no-brainer but it isn’t always easy. For a Blogger, this means making your content the primary focus and arranging your site into categories so people will stick around to read your past work. It means tidying up and caring for your webspace so readers feel comfortable and welcome on your site. For businesses, it means keeping your contact information readily available and your product easy to find. Today, I experienced this firsthand and was so impressed, I immediately decided to blog about it. Today, I am bragging on Amazon.com. I have to admit, I am seriously behind on the music trends. Since I met and married Jerry I was introduced to his massive collection of music so I just sort of stopped discovering music on my own. And while he has a lot of great tunes, after more than 5 years together, it has definitely become evident that we don’t always see eye to eye. So when I wanted to get Adele I decided to download it from Amazon. I don’t care for actual CDs or boxes, but I have never really been a fan of iTunes. Amazon was a perfect fit because I could download mp3s and either play them on my computer or use the cloud. Now I have only used cloud computing for Google Docs in the past so I had to learn the system. But within minutes I had my music pumping as I made dinner. But that’s not really what impressed me. 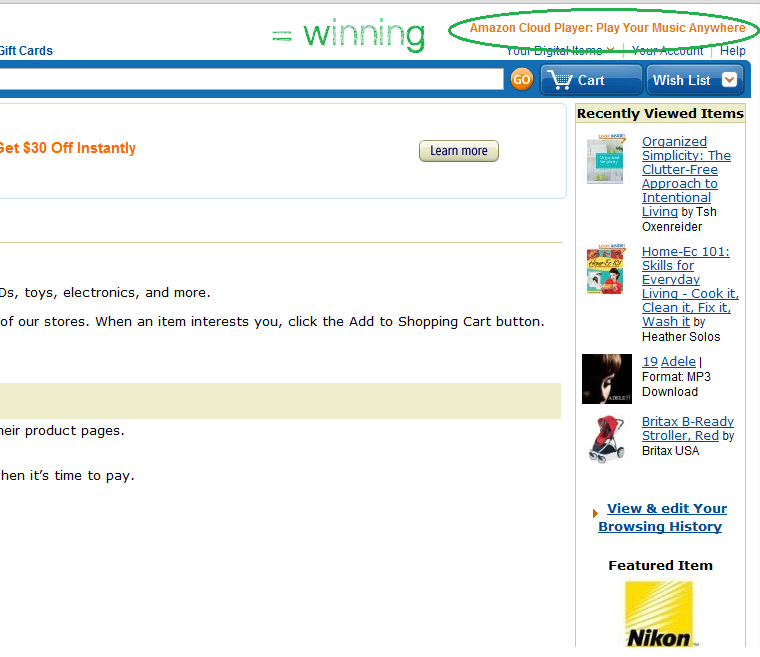 Amazon had a major win today when I logged into the site thinking, ok now HOW do I get back to that cloud thingy. I opened the site and thought if it were me I would have it up here at the top somewhere…and lo and behold! You guys, this is really huge. It’s the perfect example of a website that gets it. They were inside my head. They knew where I would look and they were ready for me. Sure, maybe I am looking for it because I blog and read about this sort of thing all the time. But you can bet if it took me any longer than 2-3 minutes to find the information, I would have a very different opinion of the cloud and Amazon itself. Instead, I am loving it, enjoying my music and taking the time to blog about my positive experience with absolutely no compensation or incentive. THAT is customer service ya’ll.